Dr. Serafina “Sara” Langdon has returned to her hometown of Angel Falls, Ohio, to help care for her grandmother who has been diagnosed with Alzheimer’s. Sara is eager to be there for her beloved Nonna, but she has mixed emotions about returning. She is happy to have more time with her siblings, sisters Evie and Gabby and younger brother Rafe and Evie’s two adorable kids, but she wonders if her father is pleased to have her join him in his practice. She is also still haunted by the debacle of a bachelor party a year ago that left her a jilted bride with a distaste for cake and left Tagg Milhouse, her boyfriend of ten years, living with the woman who jumped out of the cake in the house where Sara and Tagg expected to start their married life. Sara holds Colton Walker responsible for what she lost at that bachelor party, and she knows there is little chance of avoiding the man with whom she has been at odds (most of the time) since she was fourteen. Colton was an angry teenager who could easily have gone in the wrong direction had it not been for his dead father’s cop friends and Tagg and his family who befriended him. Now he’s chief of police in Angel Falls and a favorite son of the town where he constantly goes the extra mile to care for the people. Colton has had a crush on Sara since high school, but he has always stepped back in favor of Tagg to whom he owed a debt. But now Sara is back, Tagg is not, and Colton is determined to take his chance at winning Sara—if only he can find time between his job and caring for his grandmother and younger sister. Sara’s brother insists that Colton is a better man than Tagg, and the more time Sara spends with the police chief, the more she believes her brother. But just as she starts to believe that Colton is her Mr. Darcy, Tagg is back in town, begging for a second chance and creating complications in a relationship that seemed headed for an HEA. 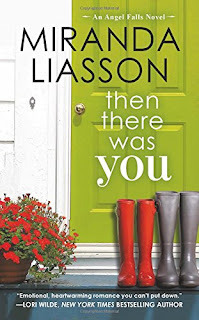 Then There was You introduces Liasson’s Angel Falls series, and it does exactly what a first book in a small-town series needs to do. First, it establishes Angel Falls as the kind of heartwarming but imperfect place that readers will want to revisit. Second, it introduces a cast of characters that readers will want to know more about. Sara’s family is an interesting group. They have suffered from the death of her mother when the Langdon siblings were young, and now they are dealing with their grandmother’s Alzheimer’s. Their father has remarried, but his silence about his first wife bothers his daughters. Lawyer Gabby is dissatisfied with her job and seems to be settling in the romance department. Firefighter Rafe’s life has been filled with loss, and he now avoids commitment. Readers will be longing for both their stories. Colton’s relationship with his young sister Hannah furnishes some leavening humor as well as some touching moments, and young as Hannah is, she is already in love. Will he prove to be the love of her life? Most important, Sara and Colton are believable, likable characters who are interesting people as individuals and whose romance offers an enemies-to-lovers tale with a bit of a twist that will win contemporary romance fans, especially those who have a fondness for that trope. Kudos to Liasson for making the Alzheimer’s thread read true. This is not anther trendy disease story. This author shows the pain of losing someone you love by degrees, the need to cherish the moments when the real person shines through, the difficulty of recognizing the patient’s autonomy as long as possible while protecting them from the dangers into which they may wander, and the reality of laughing sometimes to keep from crying. I’ve been there, and I confess this story moved me to tears more than once. At the same times, Nonna’s story never overshadows the romance. And I love the fact that her unfiltered comments move several threads in the right direction. This first book was sufficient to make an Angel Falls fan of me. If you like small-town romance that feels real and touches your heart, I think you will like this one too. Have you read any of Miranda Liasson's books? Do you enjoy light, fun contemporary romances or those with more emotional depth? Or maybe, a bit of both? Colton is a police officer and and Sara's brother, Rafe (please let him have his own book!) is a firefighter. What is it about a man in uniform? I have enjoyed every one of Miranda's books that I've read. What sort of book I prefer changed with my mood, so I'd have to say I prefer a bit of both lighthearted and deeply emotionalbooks. I enjoy both as well, Glenda. I just finished reading Then There Was You and enjoyed it a lot. I'll be buying the rest of the series for sure! Miranda's novels are captivating and special. I enjoy books which are profound and meaningful. A Man in uniform makes me feel secure and safe. A man who has principles and integrity. Thanks for this lovely feature and giveaway. I enjoy the depth of emotion in Miranda's books. Hope you give this one a try. I have read Miranda's memorable stories which I love. Books that have depth and emotions give me great pleasure since they are unforgettable. Men in uniform have strength of characters and are real men. I have not read this author though I have heard good things about her books. I tend to need both some humor and emotional depth to my books to feel satisfied with a read. As for men in uniform, they represent a protective and capable nature to me and that I why I love them so. I have read several of Miranda's books and I adore them! I like a little depth to my reading, especially with romance books! Thank you for this opportunity! They're good, aren't they? I really enjoy her voice. Thanks for stopping by, Miranda! I haven't read any of Miranda's books yet - this sounds like a good one - I enjoy lighter moments, but to have them along with serious aspects to a story makes more of an impact by both. I haven't read all of her books but I've enjoyed the ones I have read. Like Janga, Then There Was You has made me an Angel Falls fan. This is a new author for me. But I love small town romance stories and enemies to lovers are my catnip. I'm definitely going to take a look at Miranda's books. Thanks for a great review and giving us a chance to win. Liasson really does small town romance well. This is such a good enemies to lovers story! You have introduced me to another new author. I thank you - a curse upon you for making me find more books to read. This does sound like a book I would love. I enjoy small town stories. I like humor in the stories I read, but I am aware that life has ups and downs. Angst is a reality. And men in uniform....not sure what it is......but I think it may be that we see a hero when we see a man in uniform. I love her books. I believe I have read them all so far. I won a couple of trade paperback books. I can't wait for this new series to begin. I'm delighted to be introduced to a new to me author. I am off to check her out. Thank you. You're welcome, Tina! Thanks for stopping by today. Hope you'll visit us again! I've enjoyed other books by Miranda and hope to read this one too. I enjoy the gamut from light to heavy depending on the story and what it needs. I've only read one of her books b7t that was enough for me and now I'm a fan. Glad to hear you liked this one. Miranda Liasson is a new author for me. The mood I am in usually determine which type of book I decide to read. I like both light and serious types of stories. Many who choose to wear the uniform (law enforcement, fire fighter, military) share many of the same characteristics. They tend to be determined, brave, loyal, and caring. I don't know what it is about a man in uniform, but it gets me every time.